Given my advanced age (I am now approaching 142) and the fact that I’ve been running for decades, you’d think I’d have ran a squillion marathons, wouldn’t you? I’ve ran hundreds of races and done many, many very long runs (including my now infamous 96-mile run along the West Highland Way). My longest runs tend to be kinda unofficial though; I just set out when I feel like it and keep running ’til I want to come home again. So, I’m not an inexperienced runner by any means but I did start to think it was time I signed on the dotted line and got a proper 26.2 miler out of the way. I duly hustled two friends into joining me for the Amsterdam marathon and set my sights on doing it and doing it right (I’m pretty sure there’s a song in that somewhere – do drop us a line if you work out what it is). 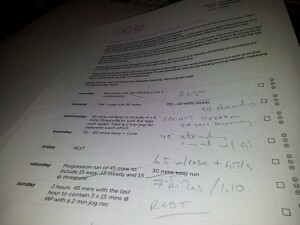 I knew I needed to get with the programme so I used the marathon training plan from Run Lounge, which was brilliant. It not only told me what I should be doing but also why. This was great for someone like me; I’ve been running so long that a lot of it is more or less intuitive now (step up mileage for a race, cross train regularly, don’t forget to rest etc). 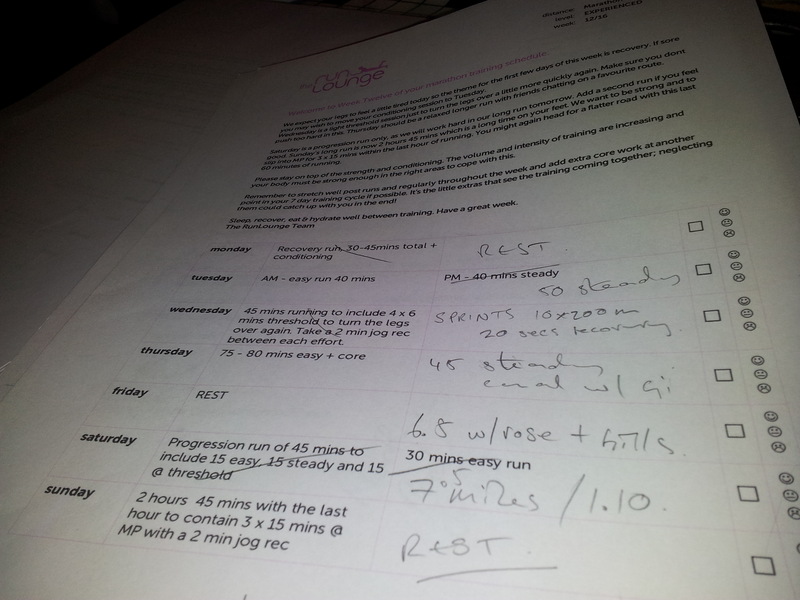 Having a step-by-step programme meant that I felt fully prepared on the day. Terrified, of course, but prepared. You won’t be surprised to hear that I paid a good deal of attention to my diet. We’re our own taste-testers at Veggie Runners (though a surprising number of our friends offer to help – funny that…) and all of our recipes are created with running in mind. In general, we aim for a healthy, balanced diet that provides all the essential nutrients. As the marathon approached, though, I had to start thinking more specifically about precisely what my body needed at any given time. As scary deadline – er, I mean ‘race day’ – approached, I knew I had to increase my protein intake. The more training you do, the more you need to look after those increasingly fatigued muscles. Sales of tofu, quinoa, beans, pulses, eggs and cheese in this town rocketed (or would have done if I was bigger that five foot nothing – they did maybe blip a bit though, she says like she thinks she’s a tall person). Then in the final week came every runner’s favourite, carb loading. I became obsessed with my glycogen stores and started picturing little bags of fuel filling up all over my body. Not a particularly attractive image but it really worked for me! Race day came and I really, truly felt totally, absolutely sick, convinced that there was absolutely no way that I could run 26.2 miles all in one go. Despite all the training and the careful planning, I honestly couldn’t imagine how my little legs could run all those miles without wanting to stop for a rest somewhere along the way. To the best of my knowledge, little rests were not an option (I wasn’t thinking catching my breath, more cake shop and a nice cup of tea, which I was pretty sure wasn’t allowed). So I decided, albeit with continuing trepidation, I’d just have to get my head down and get on with it. 1 We were setting off from the Olympic Stadium. It’s very old and, at the risk of sounding rude, a bit decrepit by London 2012 standards, but we ran under those rings and that’s all that mattered! 2 The friends I was running with were hilarious, supportive and lovely. Sarah and Kimmy, I cannot thank you enough! 3 I’d read and absorbed some of the lessons from Chi Running. It’s like Tai Chi for runners (erm, not that I do Tai Chi) and is basically about being mindful and in the moment, not getting stressed about whether it’s ‘good’ or ‘bad’, just enjoying it for what it is. All hail chi running, I say – it was invaluable. 4 I had a pocket full of gels and had the good sense to take one every 5K. I would have used them anyway but big thanks to Sport Pursuit for providing them for the race. Although Amsterdam marathon is flat, it’s not the most exciting race route, to be honest. There’s a lot of running around the outskirts and you don’t get to pass the city’s most iconic landmarks. You don’t see any windmills and not even many canals! Once I started running, though, I had absolutely no doubt that I could do it and didn’t really mind that I was running through industrial estates and, to be frank, quite dreary suburbs. The crowds were warm and friendly – they weren’t out in Great North Run force but there were plenty of people lining the streets and we got some useful boosts from high-5ing kids along the way. There was music too; never has banging techno and power pop been more welcome. Miraculously, I didn’t have a dip in energy or morale at all on the way. Indeed, my last 5K was my fastest! 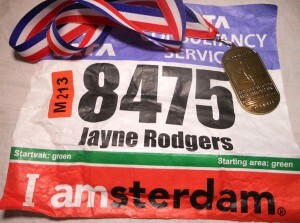 While I didn’t quite romp home – 4.21.55 was my official time – that’s not so bad for a 142 year old. Jess, how lovely to hear from you, even if you are calling me a lunatic! Fair point, I concede… You win the first prize in the Rubbish Lyrics Recognition Contest – a woman after my own heart. If you think the young women you work with would like to create a running playlist, drop us a line – would be great to see what they come up with.